microsatellite; leaf hairiness; leaf nectarilessness; genetic linkage map; Gossypium tomentosum. Gossypium tomentosum, a wild tetraploid cotton species with AD genomes, possesses genes conferring strong fibers and high heat tolerance. To effectively transfer these genes into Gossypium hirsutum, an entire microsatellite (simple sequence repeat, SSR)-based genetic map was constructed using the interspecific cross of G. hirsutum × G. tomentosum (HT). We detected 1800 loci from 1347 pairs of polymorphic primers. Of these, 1204 loci were grouped into 35 linkage groups at LOD ≥4. The map covers 3320.8 cM, with a mean density of 2.76 cM per locus. We detected 420 common loci (186 in the At subgenome and 234 in Dt) between the HT map and the map of TM-1 (G. hirsutum) and Hai 7124 (G. barbadense; HB map). The linkage groups were assigned chromosome numbers based on location of common loci and the HB map as reference. A comparison of common markers revealed that no significant chromosomal rearrangement exist between G. tomentosum and G. barbadense. Interestingly, however, we detected numerous (33.7%) segregation loci deviating from 3:1 ratio ($P \lt 0.05$) in HT, mostly clustering on eight chromosomes in the Dt subgenome, with some on three chromosomes in At. Two morphological traits, leaf hairiness and leaf nectarilessness were mapped on chromosomes 6 (A6) and 26 (D12), respectively. 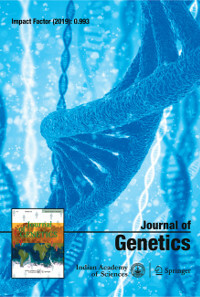 The SSR-based map constructed in this study will be useful for further genetic studies on cotton breeding, including mapping loci controlling quantitative traits associated with fiber quality, stress tolerance and developing chromosome segment specific introgression lines from G. tomentosum into G. hirsutum using marker-assisted selection.